A day later and just across the street from where Berkshire’s meeting was held, Tom Gayner co-CEO of Markel, was also asked about this. 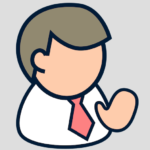 He said that in today’s world, a moat is really how innovative a business is. How it can adapt and invent faster than competitors. He flagged Amazon as an example. So who’s right? 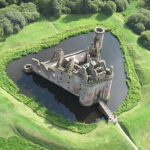 Are moats really extinct? No longer relevant in today’s business world? What is an economic moat? Most businesses have some competition (unless they are regulated monopolies). As businesses become more profitable, they inevitably attract even more competitors. 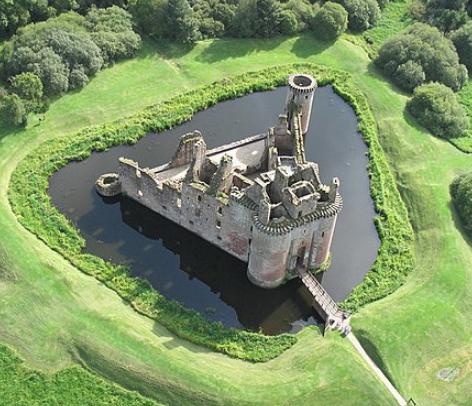 If we think of a business as a castle, a good way to fend off invaders would be to dig a moat around it. The deeper and wider the moat, the harder it’d be for competitors to surmount it. So, an economic moat refers to the durability of a business model. Can it keep competitors from taking away the business profits? Does the business have staying power, barriers to entry, a competitive edge, a durable franchise? In my view, both Elon and Warren are right. One just need to understand where they are coming from. Elon, on one hand, is talking in the context of his automotive company. Tesla, like all other tech companies, could never dig a moat deep enough to rest on its laurels. This is true for all nascent tech companies but even the established tech behemoths can scarcely afford to stop innovating. The question posed to Elon was about Tesla’s supercharger network that has the first-mover advantage in scale, but Elon knows he can’t count on it alone to keep competitors away. On the other hand, economic moats do exist and are meaningful for investors to consider when evaluating a business’ staying power. But they can erode over time and with determined competition. So, moats, by themselves, won’t give a company lifetime protection. Businesses still need to adapt, change, innovate as their business environment requires. But moats don’t disappear quickly either. They allow companies time to recover from missteps, bad lucks, and sometimes even, ineptitude. Beyond tech, other types of businesses (often consumer oriented) can also develop a durable moat around them by virtue of scale, brand, or reputation. These non-tech businesses don’t need to invest heavily in innovation year in and year out. Once a moat is established, competition can be kept away by following the same business practices that built their advantage in the first place. When Buffett jokingly mentioned his candy company, he was not just being glib. A candy company, like Berkshire’s See’s Candy, has very little to fear from new competition so long as it had established a brand and a reputation among its customers. There is just not that much in candy business that can be transformed by enterprising competitors. Buffett has often extolled virtues of his consumer auto insurance business, GEICO, for similar reasons. The moat in a business like our auto insurance business at GEICO is low cost… To the extent my costs get further lower than the other guy, I’ve thrown a couple of sharks into the moat. Businesses like See’s Candy or GEICO do not require a lot of R&D expenses or capital expenditures to sustain their business moats. More of their profit dollars get delivered to the owners – and very little to reinvestments. Consider Costco as another example of such a business. It is one of my all-time favorite business to own. It has successfully dug a wide moat around itself by virtue of its scale, reputation, and culture. Costco’s entire business model is built upon finding best values for its customers. Its mission statement is: “continually provide our members with quality goods and services at the lowest possible prices.” By virtue of its huge scale, it extracts best prices from vendors and passes on nearly all of the savings to customers. By faithfully adhering to its customer-centric focus for decades, it has developed a lasting and trusting relationship with customers. Throw in excellent customer service and a happy employee base and it’s not hard to see how they’ve built a durable franchise. Even the mighty Amazon that has wreaked havoc on many retailers has been unable to harm Costco’s business. From Morningstar’s five factor model above, Costco has reputation (#2), scale (#3), and ability to lock out competitors (#5) – three important sources for its wide economic model. #2 and #3 are self-evident. #5 is due to its vast dual-sided network of vendors and consumers. Vendors prefer to sell into the Costco network due to its staggering size. And consumers love to shop with Costco for its outstanding deals. Both sides reinforce the value of the network over time. Costco’s finances also bear evidence of its wide moat. Net income margin of the business has always been at or below 2%. And even with this razor thin margin, it delivers positive free cash flow every year and still spends billions to expand its footprint. From 2017 annual report, it had zero R&D expenses. It had $2.5B last year in capital expenditure – mainly for acquiring land, building, equipment for new warehouses. All its growth is organic – it does not acquire other businesses (zero acquisitions in last ten years). And still managed to pay $3.9B in cash dividends and $470M in share buybacks to the shareholders. Tech World. As Elon pointed out, tech companies (even those who have dug a deep moat around themselves) must continue innovating. In sharp contrast with retailers, tech companies spend vast sums of money on R&D and capital expenditures. Most of them are also aggressive acquirers of other businesses. They can’t afford not to. Granted that some of this investment is meant for growth, an equally important consideration is to keep competitors at bay. Such is the nature of this industry. If they stop tending to the moats, sooner or later they get eroded and overtaken. Take a look at big technology’s average ten-year spending below. You can see how much they spend on research and development, acquiring property and equipment, and buying smaller firms for their technologies. Costco, on the other hand, doesn’t need to spend much on R&D or acquisitions. It only focuses on acquiring land, building, and equipment for new and remodeled warehouses. Quick aside: note how Apple spends much less (as percentage of its operating cash flow) than other big tech companies on these three buckets. 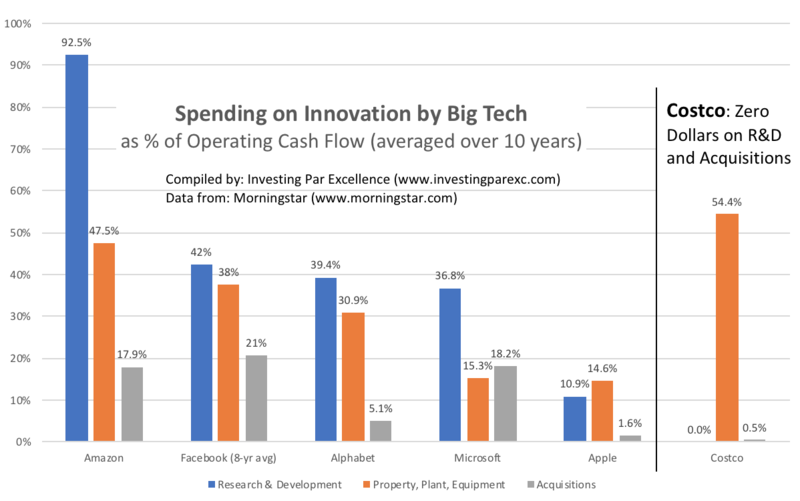 Dollar wise, it is a big spender on R&D but when taken in the context of its huge cash flow, its R&D costs are less significant than other tech titans. On top of it, Apple has always been a prudent less aggressive acquirer than others. It’s no wonder that Buffett likes Apple! Proceed with caution. But this is not about discouraging you from investing in tech companies. They can be great long-term investments – as some of them have already proven. We investors just need to understand the nature of that industry. Moats are hard to establish and even harder to maintain in the tech world. I follow technology companies. I invest in them. Some of them have clearly dug a wide moat to protect their businesses. I don’t mind them spending on R&D or cap ex. Those who have a wide moat are very profitable and can afford to spend. In fact, I’d worry if they stop spending on innovation. Beyond tech, I am generally attracted to businesses that have erected barriers to entry and possess competitive edge (in other words, economic moats). Most of my portfolio consists of companies who have already built formidable moat – or I believe they are in the process of building one. I also understand technology. I worked in the tech industry for most of my professional career. So, I invest in tech as well as other non-tech businesses. I try to invest wherever I find a durable franchise that could withstand competition. From my top 10 holdings, six are in technology sector – the rest are in retail, financial, and industrial sectors. If you understand technology, investing in tech businesses can be very rewarding. On the other hand, if technology is outside your circle of competence, stay away from them. You can find wide moat businesses elsewhere too.